Fun with Mom! Dinosaurs & Donuts or Mommy & Me Unicorn Tea - donuts or cupcakes, juice, sweet tea will be provided. CFPAA is now registering for Spotlight Junior Theater - Alice in Wonderland! First class on 4/29! Mention Hulafrog for 10% off! 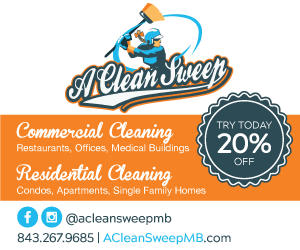 Call today to schedule a residential spring cleaning with the incredible crew at A Clean Sweep Myrtle Beach!